Starring: Shailene Woodley, Theo James, Kate Winslet, Ashley Judd, Tony Goldwyn, Jai Courtenay, Zoë Kravitz, Maggie Q. Teen movies exist in five factions: the fart movie, the comic book movie, the coming-of-age movie, the horny-but-PG-13 comedy movie (a derivative of the fart movie), and the Young Adult movie. The other teen movies are the Factionless (semi-arty films and such) and they usually die at the box office. All other factions of teen movies are generally punching bags for critics and post-pubescent viewers alike, but the most dauntless faction of recent teen films is arguably the Young Adult movie. The hit-or-miss adaptations of teen-lit franchises can either become roaring blockbuster or collapsed tent-poles (see Twilight and The Mortal Instruments, respectively), yet the sheer volume of page-to-screen endeavours ensures that the business of adapting books for ready-made YA audiences is here to stay. Few of the films have really enjoyed crossover appeal with both critics and adult audiences, although The Hunger Games franchise proves the most recent and most notable anomaly. (Harry Potter, too.) The success of The Hunger Games makes an offshoot YA counterpart inevitable and it’s finally here almost two years to the day of the first Hunger Games’ gargantuan opening weekend. That film, of course, is Divergent. Divergent, based on the popular book of the same name by Veronica Roth, joins The Hunger Games as one of the few teen-targeted YA flicks to get the job done right(ish). Divergent has an awfully high bar to meet in order to match The Hunger Games and while it might not be in the league of the first adaptation of the Suzanne Collins franchise, this film is nevertheless an entertaining thrill-ride in its own right that should please fans of the book and newcomers alike. Divergent, like The Hunger Games, takes place in a dystopian future in which citizens are tethered to a fateful event that happens around the peak of their adolescence. Instead of a reaping, the citizens of Chicago are subjected to Choosing Day. Choosing Day celebrates the potentially life-changing day on which young people decide to remain faithful to their factions or opt to choose a new lifestyle. The citizens of this compartmentalized future are divided into five factions that are based on personality types in order to streamline harmony and facilitate social control. The five groups are Candor (the honest), Amity (the peaceful), Erudite (the intelligent), Dauntless (the brave), and Abnegation (the selfless). Beatrice Prior, played by The Descendants’ Shailene Woodley, hails from Abnegation. Beatrice, however, takes the mandatory aptitude test on Choosing Day Eve and the examiner (Maggie Q) feverishly Beatrice that she fails to fall easily into one faction. Beatrice is Divergent, which threatens the orders of the Powers that Be as she aligns with multiple factions yet conforms to none. Divergents are independent, multifaceted, and adaptable; they’re the members of society least susceptible to social control. This information prompts a feeling that has been stirring in Beatrice’s gut and she switches factions on Choosing Day to the disappointments of her parents (Ashley Judd and Tony Goldwyn) and joins the Dauntless. Beatrice, renamed Tris in her new life, assumes a competitive rivalry with her fellow converts to the Dauntless, but her selflessness and her smarts give her the long-term advantage. Tris catches the eye of her trainer, Four (played by Theo James aka Mr. Pamuk from “Downton Abbey”) and the attention of the Erudites’ calculating leader Jeanine Matthews (Kate Winslet, bringing considerable wattage to this film), and she tests the power of her Divergence by assuming a leadership role within her recruits while flying under the radar and keeping her identity a secret. There’s a hint of Katniss Everdeen to Beatrice Prior as she becomes the renegade heroine amongst all the child soldiers of Dauntless. She’s a strong, well-rounded young woman with a firm moral centre. Woodley carries the role more than capably and offers a heroine worthy of her predecessor from the Capital. Woodley, like Hunger Games star Jennifer Lawrence, has the depth of talent and the screen presence to provide a character that is both entertaining and accessible for young audiences. The material might not quite allow Woodley to take the character as far as Lawrence can with Katniss, but Woodley makes Tris substantial enough to compel mature viewers and, more importantly, engage with the younger crowd with a greater level of intelligence than that for which teen-lit fare usually gives them credit. Tris also has all the elements one wants in a strong leader (especially in a dystopian future…), as she has the tact, smarts, and sheer bravura to further the needs of both herself and others. 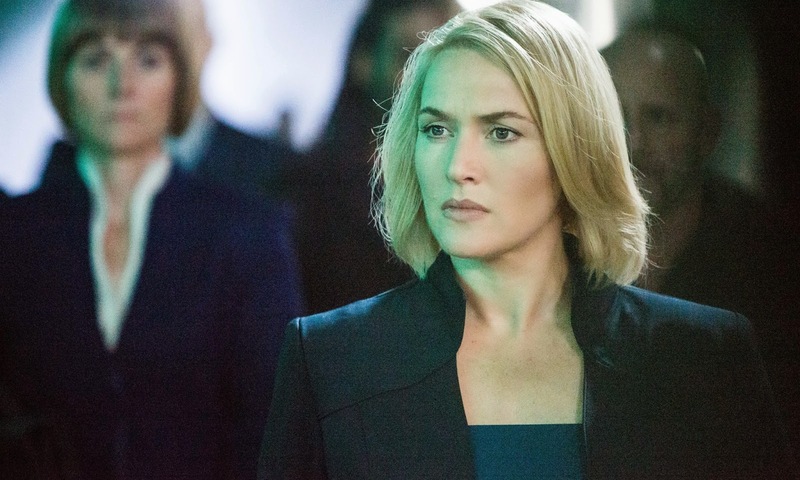 Woodley gets her greatest match in Divergent’s most surprising asset in the form of Kate Winslet as the villainous Matthews. Winslet plays against type in Divergent by offering a darker side that’s rarely the external layer of her characters, except to some degree in The Reader, and the result is quite effective. Winslet’s Jeanine is a cold and detached member of the intelligentsia, and her icy stare of ivory tower intellectualism provides Tris with a great foil. Divergent beefs up the presence of Jeanine considerably for the film—she has only a scene or two in the book—and the shrewd capitalization on Winslet’s screen presence gives Divergent its greatest improvement upon the novel: the film has a tangible villain and an evil force to both offset and confront Tris’s heroism. Tris fights little besides unseen social forces in the book, so the ever-present Erudite leader gives Divergent more momentum and narrative closure as the film reworks the finale to close one film and invite the beginning of another. Die-hard fans of Veronica Roth’s book might be disappointed with how considerably the book diverges from its source, but any infidelity is to the film’s advantage. Divergent, the book, is an exhaustingly expository set-up for the next two-thirds of the trilogy. It’s plot-heavy and descriptive with few literary passages that add depth instead of merely fuelling the story. It’s simply a matter of adaptation, then, that a sizable amount of the prose must be lost while bringing Divergent to the screen. Almost every word and sentence of the book carries an action, so characters and storylines are condensed and excised in the film. However, the result is a brisker film with a greater villain, a bit more subtlety, and fewer needless training scenes. Divergent still suffers from the gross expository build-up that betrays the novel, but director Neil Burger (The Illusionist, Limitless) keeps the action going at near-relentless speed to keep the story engaging. It befits Divergent, too, that Burger is more adept a filmmaker than Roth is a writer, so this Divergent has a degree of finesse and artistry that’s somewhat lacking in the novel. Burger provides some spectacular set pieces amongst the rapid action, especially the pivotal turning point of the Capture the Flag training mission that develops the emotional arc between Tris and Four while providing a dynamic action sequence in which Tris learns to use her Divergence to her advantage. Burger gives Divergent a slick and solid packaging full of Inception-y overtones with its steely cinematography and powerful score. The craftsmanship is more serviceable and more conventional than that of The Hunger Games, for better or for worse. (The unobtrusive style of Divergent might not alienate viewers like the shaky camera of The Hungers Games did, but the same effect also affords the Katniss caper a level of artistry wholly absent from the YA genus.) Breathlessly anthemic music by Junkie XL also keeps the pace lively for Divergent’s ultimately arduous ride of 139-minutes. Divergent certainly has room for improvement (Insurgent, take note), but it finds itself in the rare faction of teen-lit movies that are good. The film, like its resilient heroine, is a flawed polygon of both strength and smarts. Divergent is a thrilling adventure for any faction of filmgoers. Divergent opens in wide release March 21 from eOne Films.